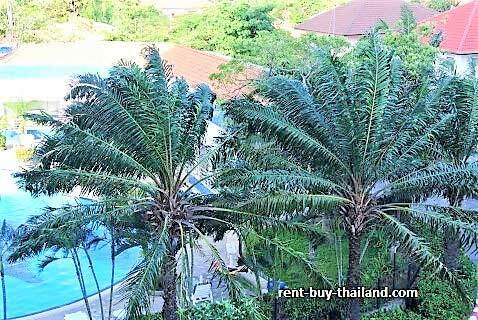 Rental Price 15,000 - 24,000 Thai Baht per month depending on season and length of stay. Thank you! A member of my team will be in touch soon. This studio property is on the fourth floor of the View Talay 2B Condominium; it is decorated to a high standard and fully furnished. The kitchen area is very modern and of a European style. It is fully equipped with all you need, including utensils, cutlery and pots & pans. The kitchen also has a large marble work surface, plenty of storage, an electric hob, extractor fan, hot water kettle, toaster, microwave and refrigerator. In the good sized living/sleeping area there is a double bed, storage facilities including a double wardrobe and display units along with a flat screen TV with DVD player. There is also a dining table with chairs, coffee table, arm chairs, and access to the balcony, complete with balcony furniture, via large sliding doors. The bathroom, which is fully tiled, has been designed and completed to a high standard, features a large marble work surface housing a basin and storage facilities, and a large walk in shower. This View Talay studio for sale also benefits from tiled flooring throughout, as well as an impressive feature ceiling with concealed dimmer lighting. There are also curtains, down lighting, air conditioning and ceiling fans throughout. View Talay 2 residents benefit from some great facilities, including a huge palm tree lined communal swimming pool, with a large children's pool and poolside restaurant. There are also a number of shops and small businesses in the building for your convenience, including massage and beauty parlors, laundry, cleaning, taxi and travel services, and a mini mart. The complex also has parking, CCTV and 24 hour gated security. View Talay 2 is in a fantastic location in which to explore Pattaya and the surrounding area; on Thappraya Road, in the center of Jomtien, the complex is on the main Baht Bus route between Jomtien and Central Pattaya, making getting around quick and easy - for just 10 Baht you can be in Central Pattaya in minutes. Jomtien Beach is close by, as are many restaurants (both international and local), bars, a supermarket, shops, a fresh food market and entertainment venues (including Super Town - Jomtien's Walking Street). Buy property Pattaya - Flexible payment plans available to help you buy your condo with us - no credit check needed. Other studio for sale Pattaya and Jomtien areas, please inquire for further details.